Black ice brought traffic to a standstill on the Maine Turnpike Sunday evening. During the daylight hours, the roads remained relatively safe. But between 5 and 5:30 pm, the sun began to set and conditions changed drastically. Around 5 pm, a tractor-trailer jackknifed across the northbound lanes of traffic, between Falmouth and Gray, forcing Maine emergency responders to shut down several northbound lanes of traffic. The Maine Turnpike Authority also reported multiple motor vehicle accidents in the northbound lanes. This winter driving scenario highlights the importance of understanding the dangers of winter driving in Maine, especially when black ice becomes a factor on roadway surfaces. All vehicles (such as the tractor-trailer involved in Sunday’s turnpike accident) respond differently to black ice. It is important to understand how your vehicle responds in snowy, icy conditions before they occur so that you can keep yourself and the occupants of your vehicle safe. Although good tires and a well maintained vehicle are important safeguards for winter drivers, experts cautions that there are no tires, brakes, vehicles or equipment that can help you stop on black ice if you are driving too fast for conditions. Excessive speed is one of the biggest factors in deadly winter automobile traffic accidents, and overconfidence due to four wheel or all wheel drives, anti-lock brakes or other bells and whistles on your vehicle can lead to deadly over confidence when driving in wintery conditions. It is vital for your safety and the safety of other motorists to leave extra distance between vehicles (a minimum of 8-10 seconds between vehicles), and to travel no more than 35-40 mph in icy, snowy conditions. If black ice conditions exists, speeds of 10 mph may be too fast! AAA suggests that motorists practice slow speed maneuvers in an empty snow covered parking lot to get a feel for how your vehicle responds in icy conditions. In addition, it’s wise to familiarize yourself with your vehicle’s breaking system by reading your owner’s manual. Above all, remember that no matter how experienced of a driver you are, no driver is immune to the dangers of black ice, and should therefore always remain vigilant and cautious when driving in wintery conditions. Black ice can form very quickly, and can be extremely difficult to detect. The Occupational Safety and Health Administration calls black ice one of the deadliest of all winter driving hazards. Remember: there are no tires or equipment that can help you easily stop or start on black ice – no drivers are immune to this extreme danger. ALL drivers must slow down and take extra precautions on black ice. If you can, stay off the road when winter driving conditions are forecasted to get ugly. Better to be at home safe than battling the snow, ice and traffic on the turnpike if at all possible! Maine drivers must be on the look-out for this dangerous, deadly hazard so that they can recognize to respond to this dangerous condition by slowing down. The following tips will help you recognize black ice, and give you some should you encounter icy road conditions or black ice. Areas of road that look wet, dark or like new pavement. Shady areas, or areas with puddles , standing water or areas that may get run off water from melting snow or rain. Any time the temperature is below 40 degrees. Evidence of other vehicles sliding. If the road surface looks dark or wet, watch the vehicle directly in front of you. If the vehicle is not leaving tracks or “throwing water” from its wheels, the roadway may be covered in black ice. Proceed with caution! Do not use cruise control in icy conditions. You must have complete control of your vehicle in icy, snowy conditions. Slow down, don’t tailgate and leave extra distance between vehicles. Avoid sudden, jerky movements when conditions are icy. Make smooth, precise movements with your steering wheel, and don’t slam on the brakes. Anticipate lane changes, curves in the road, exits, etc. Don’t pull out suddenly into oncoming traffic. This will help you avoid skids and emergency situations. Wear your seatbelt, and insist the occupants in your vehicle buckle up as well. Minimize distractions. Don’t text and drive or drive impaired in any way. Don’t drive when you are fatigued. Winter driving demands the full use of your faculties and demands a great deal of concentration and attention. Don’t slam on the brakes. Use smooth, controlled movements if you need to hit the brakes or slow down. Anticipate curves, lane changes, and look ahead 20-30 seconds for any moves you may need to make so that you’re prepared. If you have anti-lock brakes, do not pump the brakes if you need to stop. Depress the brake completely and hold it. The vehicle’s ABS system should allow you to brake without locking and allow you to slow your vehicle as you steer. If you do not have anti-lock brakes, use the “heel-and-toe” braking method. Keep your heel on the floor as you use your toes to press the brake pedal firmly without completely depressing and locking the brake. Do this repeatedly until you come to a full stop. If the brakes lock, release your foot briefly, and go back to the “heel-and-toe” braking method. If your vehicle begins to skid, remember to steer in the direction of the skid. It may also be helpful to shift your transmission into neutral when you are trying to come to a controlled stop on black ice. Above all, remain calm. If possible, steer away from other vehicles, into the side of the road and away from trees, girders, etc. Educating yourself about the dangers of winter driving in Maine is an important way to keep you, your family and other motorists safe. 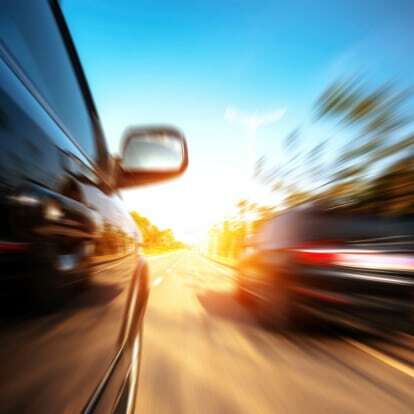 If you have been injured in a motor vehicle accident and you suspect the other driver was impaired, driving recklessly or knowingly driving an unsafe vehicle, please contact the experienced Maine personal injury team at Hardy, Wolf and Downing. We have handled thousands of Maine personal injury cases and motor vehicle accident cases, and know exactly how to handle insurance companies, investigators, and what questions to ask to get you the compensation you deserve. Don’t settle for less than you deserve if you have been injured in an automobile accident due to another driver’s negligence. Call the personal injury team at Hardy, Wolf and Downing, and let us fight on your behalf.